Real-time video chat site ooVoo today announced the release of the newest version of its real-time video chat service, ooVoo 1.5. ooVoo 1.5 offers new ways to create and share content including recording a video conversation for friends or colleagues or for posting online. The video recording services is designed so that you can record conversations to create video ‚Äúnotes‚Äù of an online meetings, and so that you can create video interviews to put on your site. The length of a recorded conversation is limited only by the storage capacity available on your hard drive. ooVoo has also added a suite of visual effects, such as backgrounds and facial overlays of characters and creatures, that you can add to your video messages and live video conversations. In addition, the visual effects package lets you share a desktop and files from their computer, on screen with participants in a conversation. ooVoo 1.5 also allows ooVoo calls, from anywhere in the world, to a mobile phone or landline in the continental U.S. and Canada. 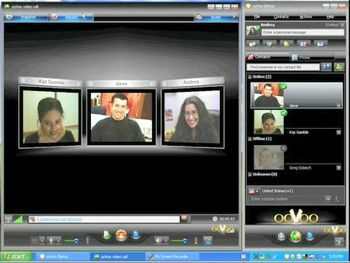 This allows those who are unable to join via a computer meet with up to five others in an ooVoo conversation. ooVoo has also announced plans for My ooVoo Day (which is actually a week), a promotion starting on Feb 10th that will feature popular bloggers in live video chats. I hadn’t heard of this yet. How does it compare to Seesmic? It sounds kind of cool – but I hate the name. Oovoo sounds like a little dog. Looks like it does everything Seesmic does, plus the real-time video conference recording. The bells and whistles on ooVoo look neat, and I’m hearing a lot of folks on Twitter talking it up. Unfortunately, it doesn’t work (yet) on the Mac, which seems goofy to launch a product and not have it work on the platform that so many of the early-adopters of tech are using. So, for now, I’ll stick to Seesmic, which is interesting, useful, and fun. This is totally different than Seesmic. With ooVoo it’s live chat – and you get up to 6 people in a chat at a time. I work on behalf of ooVoo and just wanted to add alittle bit more about ooVoo for people looking at different video conferencing options.ooVoo is a free video chat download that allows up to 6 people to have a video chat at the same time. One can also take part in the video chat through an audio feed if they don‚Äôt have a webcam. Thanks for the extremely positive review of ooVoo. It’s great that you are getting the word out about the convenient free applications available online. As a representative for ooVoo I would like to invite you to ask me any questions you may have about the product and its offerings. Feedback is always great so we can know where our users would like us to improve our service. Where the recorded data will be saved in hdd ?